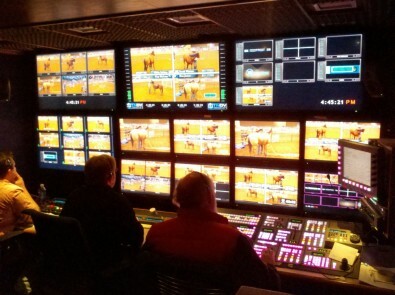 This year TNDV supported its 10th the “Road To The Horse” competition with its "Aspiration" HD production truck. The “Road to the Horse” is a major horse riding competition in which riders must tame and navigate an untamed horse through an obstacle course. This year it featured a “Celebration of the Cowgirl,” an all-female field of riders that was held in the spring at Horse Park’s Alltech Arena in Lexington, KY. The annual three-day event drew thousands of horse-loving spectators, as well as a global online audience that watched the live webcast on Road to the Horse TV—thanks to technical service provided by Nashville, Tenn.-based mobile production company TNDV. The event, streamed live and produced for DVD, also marked the tenth anniversary of the technical production partnership between TNDV and Road to the Horse event. At work in the Master Control area of the TNDV truck during the "Road To The Horse" competition. In the early days, “Road to the Horse” used TNDV’s first SD truck, called “Origination.” In the years since then, as the event has grown, it has moved up to using TNDV’s larger trucks—“Inspiration” and “Elevation”—and in years when the competition continued to grow in size, they used TNDV’s “Aspiration” expandable HD production truck. The later features a Sony MVS-8000 3 M/E Production Switcher. The technical production this year employed Hitachi Z-HD5000 HD cameras and Fujinon lenses to capture the excitement, and, according to Dugger, the most extensive audio infrastructure for the event to date. The TNDV team mixed multiple audio channels using a Soundcraft Vi3000 console, and all tracks were recorded to Avid's ProTools HDX and a Sound Devices Pix270 recorder. 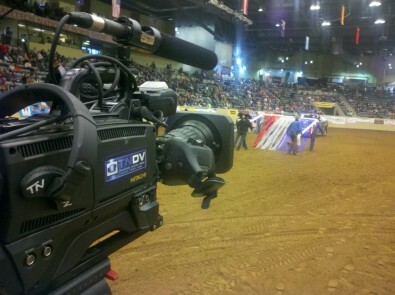 For the past 10 annual events, TNDV crews have captured the excitement of the Road to the Horse championships using multi-camera video production gear and large TNDV mobile video units. TNDV crews used Hitachi Z-HD5000 HD cameras and Fujinon lenses to capture the excitement. In the years before TNDV signed on to provide full-service video production services, Road to the Horse video was shot by a team of college students wielding camcorders, who generated hundreds of hours of videotapes that were very labor-intensive to edit down for DVD distribution. While Road to the Horse continues to offer DVDs of the productions, today’s loyal fans called Roadies can also subscribe to Road to the Horse TV, an online streaming service that showcases current and archival footage of the events.